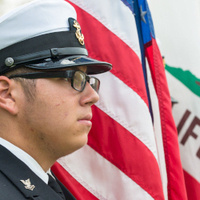 University of the Pacific Military and Veterans Service Center hosts a celebration on Monday, Nov. 12, to honor those who are serving or have served our country in military service. The program will include remarks from guest speaker alumnus Robert Mosqueda and an award presentation to a Pacific staff member. Note: This event has been moved inside to the Ballroom due to the smoke.